Before you say, "Best day of your life? PLEASE, you're exaggerating." I'll have you know that particular line was used throughout the 3-day music festival. However, I'll also share with you that it was truly one of the best days of my life and I'm sure hundreds of others would say the same. Since the first time I watched the Tomorrowland live stream, I just knew I had to be in that crowd one day. Once I realized that I was actually making a dream become reality and attending Tomorrowworld, I just could not contain my excitement. Knowing that we were leaving at 3:30 in the morning, we still stayed up watching the live stream and stringing beads to make Kandi. As we drove into the woods, it was eerily calm. After parking, we walked through a field full of cars to a body of water which we crossed. We walked through a forest and under arches leading us to what truly felt like a land of it's own. Stepping out of the woods and into the sun , my eyes locked onto the most magical stage I've ever seen. I was mesmerized as I walked closer and closer to the over 400 feet wide and 100 feet tall volcano Main Stage. I stood there looking up in awe, people dancing around me, music echoing up into the hill, and it hit me that I was actually at TomorrowWorld. A few tears fell down my face in pure joy. From there we made it to the front row with David Solano kicking things off. This was cool in particular as I've interviewed David before for DJ Mag. Just feet away from stage, we met all kinds of people including friends from Austria and Germany. I did my first Kandi exchange with a girl who had hand decorated her top and headpiece. Without planning, we were front row for one of my favorites, BORGEOUS. With our new found friends, we danced, jumped, sang along, and raged as hard if not harder than BORGEOUS himself. I wanted to not only take advantage of the great music at TomorrowWorld, but to also connect with friends I had made via the internet and friends from home. Accidentally, I ran into my friend Jess, a music festival guru, whom I met at a concert years ago. If you've been to some festivals, you may have spotted her cat, Phoebe. Heading over to the other side of the grounds, we met up with Paul Reed who works in Marketing for Life in Color. I was extremely excited to meet Paul as we've been in contact with each other for quite some time now and have a lot in common. We met at the Mad Decent Mystical Frames stage (BEST DECISION EVER) where GTA was wrapping up and Dillon Francis was on deck. If the main stage wasn't mesmerizing enough, this one surely was. Never seeing Francis live, I was beyond impressed and putting him on the Mystical Frames stage was perfect placement. The Bass was INSANE (which you'll kind of get a taste for in the below video) Under trees and by the water, we danced and threw our hands up to one of my favorite sets from the day. I took a second and laid down soaking in all of the music and the environment around me. I didn't feel out of place. Not one bit. There were people dancing, hula hooping, sitting, standing and even zip-lining. From there, we moved from stage to stage catching Steve Aoki, Dimitri Vegas & Like Mike, and last but certainly not least, Diplo. The music was killer, from one artist to the next, pulling me to dance and never thinking there was one song I couldn't stand. The production was OUT OF THIS WORLD and makes TomorrowWorld stand out from anything I've ever experienced. Each stage was elaborate in decorations and brought to life with lights, lasers, fireworks, actual flames of fire, and the large amount of speakers pushing out the sound. I can't forget to mention the infamous TomorrowWorld voice and the mysterious man with the top hat that would appear high above us to bring out new artists. Seeing it bring ALL of these people together from around the world, all so happy, was truly amazing. Say what you want about EDM, but you will never experience anything like the environment it creates and TomorrowWorld was a prime example. Unfortunately, when I attend concerts I'm used to pushing, shoving, attitudes, and more from those around me. However, this was not the case. Everyone was kind, loving, and blissfully happy to be there. The sound. The production. The people. No negativity. Peace. Love. Unity. Respect and of Course, MUSIC. An attendee commented online and said, "I was who I am meant to be at tomorrowworld," and I couldn't agree more with her statement. Everything aside, I was at my purest form. Simply, enjoying life, loving it, and enjoying what I love most, music. Normally, I'd be adamant to buy merchandise. But not this time. I had my bracelete and my memories and that's all I needed. 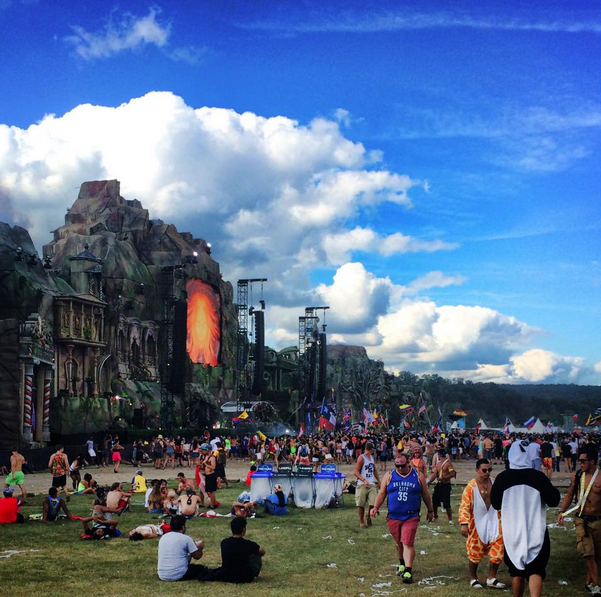 Ill be back, TomorrowWorld, I'll be back.